Quilting is NOT cheap, and batting is my least favorite thing to buy (it’s not as fun as the latest fabric!). My previous roll lasted me almost 2 years, so I’m excited to have a fresh roll stuffed into the closet. Of course instead of finishing I’m starting…a quick and easy quilt in between deadline projects. 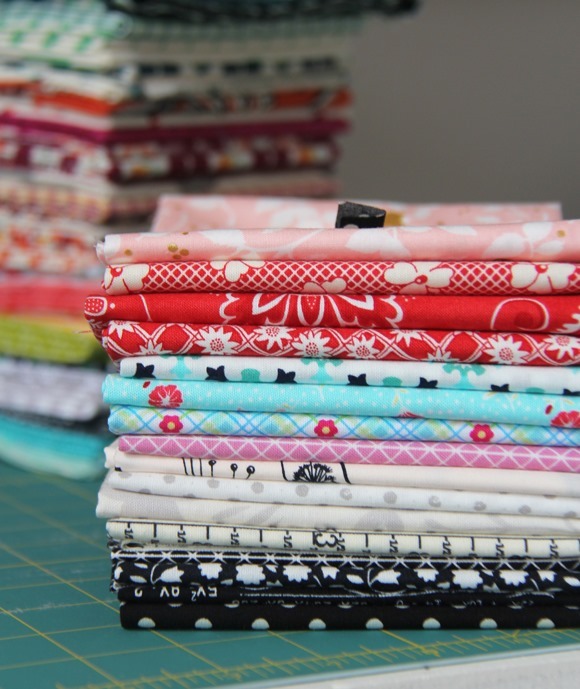 This pretty stack was chosen by Lynn for Westwood acres…most of these I’ve never seen before…which is the best part of having someone else choose fabric! Starting is always more fun than finishing a quilt! I used your bloggers choice bundle and a few from the bundle in your last photo to make the blocks for your Bizzy kid pattern. I've finished making all the blocks but haven't joined them into bigger blocks yet. I'm sure you know exactly what I mean when I say it's crazy here with the two older kids home from school all week! Have a happy Easter!!! Buying batting is definitely a drag! No wonder you got sucked into that stack of beautiful fabrics…fun!! It nice to see you each Tuesday! And that is the biggest roll of batting we have ever seen! There's something very satisfying and opulent about having very own roll of batting. 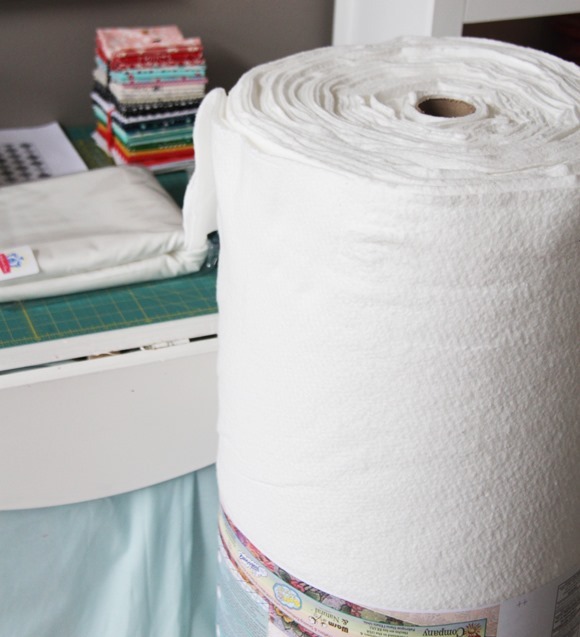 I knew I was all in to this quilting stuff when I bought my first roll and now I can't imagine quilting life without it. Wonderful fabrics! I have never bought that much batting but smaller rolls. I look forward to seeing the quilts! I can't wait to see how your quilts all turn out. Happy Quilting! Such a great bunch of fabrics!! I'd always wondered what you Northerners paid for batting! Even at its regular price it is about half what we in Australia pay… Having all those quilts finished will feel very satisfying I expect! Can't wait to see those quilts when they aren't folded up in un-viewable stacks!! :-) I love that stack of fabric in your last photo. What is the pink on top? it looks luscious!!! I get all giddy when I start pulling fabrics for ANOTHER quilt top! But, I love a new roll of batting just hanging around, too! Love your posts! Hi. Can you please tell me where you purchase these gigantic rolls of batting? Thanks! One of these days I'm going to buy a roll! My long arm has a storage bar for it so that would be good. Of course, that would just scream "scratching post!" to the kitties! When you send your quilts out to be quilted, you never have to buy batting (directly) and, to me at least, finishing them is a load of fun. I love getting mine back, when all I have to do is the binding and a label. There's such a sense of satisfaction and completion in those two last steps. 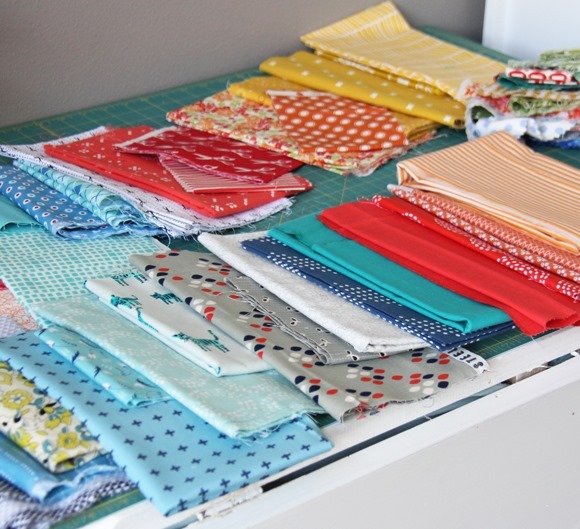 I so love this fabric and all the beautiful things you made with it! Why don't you register with a wholesaler and buy your batting wholesale? That way you can buy smaller amounts of a variety different types for different applications That's what I do. For example – you don't want to use the type of batting warm and white for a baby quilt because it is way too heavy to lay on a baby. It would be like putting your baby under a slab of concrete – a light soft thin poly is better and safer. 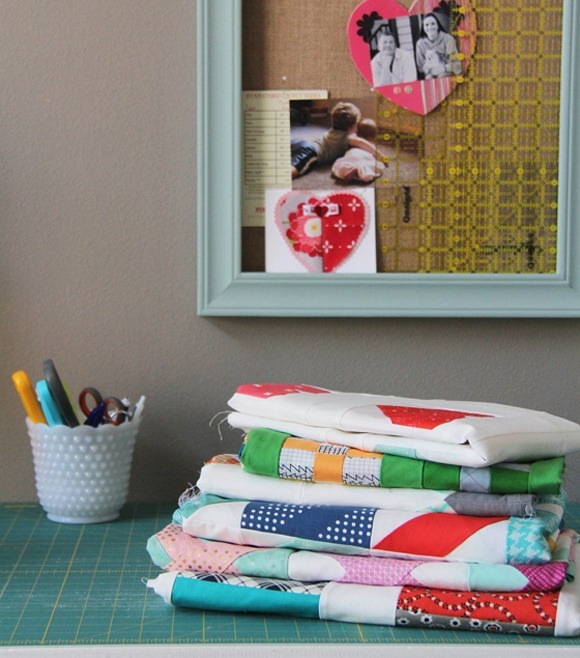 The savings really add up when you make a lot of quilts. These fabrics are beautiful! Would love to sew them. Such beautiful fabrics and happy colors! I will definitely be watching for Hazel and look forward to seeing your finished quilts. I have two quilts pin basted and ready to quilt. They've been that way for 6 months! I started sewing clothes for my toddler and that took over my limited sewing time.